I currently have a Rockwell 6S and I REALLY like it. I am sort of considering a Blackbird as they look so nice and I have read that the shave is slightly better than the Rockwell. I have seen a machined finish Blackbird in person and really like the look of it. That said, I also read that the polished model glides better while shaving and produces a better result. So, what do you guys think? Is the polished model that much better and would I really notice the difference between it and the machine finish? I think I like the look of the machined better but I wouldn't want to upgrade from the Rockwell and regret my choice. Do you find that the polished handle is slippery at all while you're shaving? That is one of my concerns about the differences between the machined version and the polished version. I currently use a pretty knurled handle and it's very grippy and I like that. I actually love the handle, the way it is grooved makes for a great grip. When i purchased mine i got the 101mm handle which was the longer handle, now i think they just have the shorter handle available. 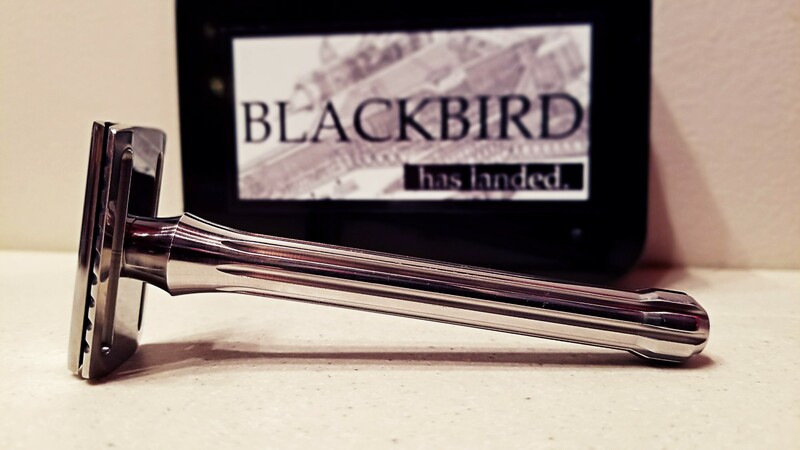 I have the machined Blackbird with the shorter handle, and it is a very efficient and smooth shaver. There is no "drag" associated with its use in my experience, and it functions as smoothly as the polished SS razors I own. I don't believe functionally there can be that large a difference, if any, between the two finishes. Some of those who have a black Blackbird have noted there is some "drag", but I have no experience with that finish. Happy shaving! I have the SB and OC blackbird with the black oxide finish. Love them both and do not notice any drag compared to my other razors. I don't know whether the difference between the machined and polished finish affects the quality of the shave. However, you may want to consider Shane's comments about the differences between the two finishes in terms of wear characteristics and durability. Look at post #157 in this thread. (11-06-2017, 12:42 PM)TheLegalRazor Wrote: I don't know whether the difference between the machined and polished finish affects the quality of the shave. However, you may want to consider Shane's comments about the differences between the two finishes in terms of wear characteristics and durability. Look at post #157 in this thread. Interesting points he makes. That said, it still seems to be no clear winner. I have all three finishes and they shave almost indistinguishably for me. After a few months, the black oxide finish rubbed off and is very smooth! It looks ruggedly handsome and shaves perfectly. I have a machined Blackbird and Sabre. I have not experienced any issues with drag. I have the black oxide and I noticed some drag when I first got it because I had too much of the top cap on my face. I don't notice any drag now that I've found the right angle. I think the drag is a good thing because you know you're doing something wrong if you feel it. (11-06-2017, 05:49 PM)DayMan Wrote: I have the black oxide and I noticed some drag when I first got it because I had too much of the top cap on my face. I don't notice any drag now that I've found the right angle. I think the drag is a good thing because you know you're doing something wrong if you feel it. I agree. 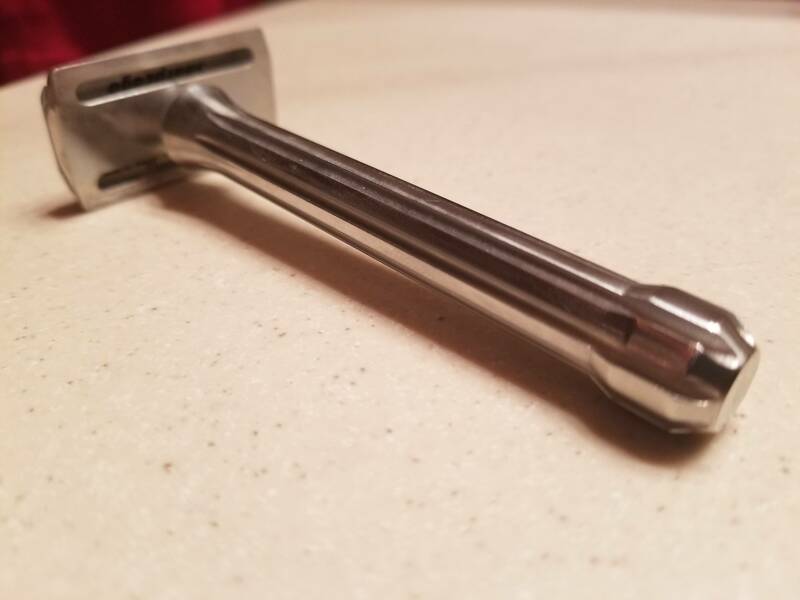 I only have the machined version, but I find it hard to believe that my face would notice a difference in the shave based on the razor’s finish. I’ve got about 60 razors, and never once thought, “This razor is dragging.” Sure, on buffing and touch up, the absence of lather is sometimes noticeable, but that has nothing to do with the razor. I have tried all three versions and found the Black Oxide to have a very pronounced 'drag', the Matte finish to have a slight drag and the Polished to have the smoothest feel. I could not use the Black Oxide version as the shaves were a bit too harsh; the Matte version allowed for a better feel, but the shaves still were not as smooth as the Polished version. I have actually sanded the edges of my Matte base-plate to get a smoother feel to it and it has worked where, now, I feel hardly any more drag and it is almost as smooth as my Polished version. The benefit is that I find the modified Matte finish to provide me with a bit more of an effective shave, now, than my Polished version, which is a benefit for me. Please, be aware that this is all quite subjective and you should not attempt this unless you really like this razor and you want to keep it. (11-06-2017, 08:08 PM)celestino Wrote: I have tried all three versions and found the Black Oxide to have a very pronounced 'drag', the Matte finish to have a slight drag and the Polished to have the smoothest feel. Is your machined razor a version one? I think Shane made some changes now to the version 2 where the edges are rounded and perhaps the sanding would not need to be done? Do you know if you have a version 1 or version 2? (11-06-2017, 08:29 PM)NJDJ Wrote: Is your machined razor a version one? I think Shane made some changes now to the version 2 where the edges are rounded and perhaps the sanding would not need to be done? Do you know if you have a version 1 or version 2? That is a good question and I am not sure which version it is. I bought it on the BST, so it may be one of the original version. Regardless, the razor is working out very well and I am very happy with it. (11-06-2017, 07:41 AM)NJDJ Wrote: I currently have a Rockwell 6S and I REALLY like it. I am sort of considering a Blackbird as they look so nice and I have read that the shave is slightly better than the Rockwell. I have seen a machined finish Blackbird in person and really like the look of it. That said, I also read that the polished model glides better while shaving and produces a better result. So, what do you guys think? Is the polished model that much better and would I really notice the difference between it and the machine finish? I think I like the look of the machined better but I wouldn't want to upgrade from the Rockwell and regret my choice. I got the polished because of the looks. If were going to get into talking about finish in regards to gliding then we can talk about the coefficient of friction in regards to the base plate and your skin and the specific blade you use and your skin... Get the razor you like the look of and enjoy it, I dont think the finish will make a noticeable difference in the glide unless the finish is raw and jagged but I doubt Shane would let a razor be like that. I wouldn't think a polished finish would glide any better than a polished one. But I only have the machined version and have never tried the polished. I have found that different materials have different "face feel" (brass vs. steel vs. bakelite, e.g. ), but soap is so slippery that I doubt I'm sensitive enough to discern a difference in glide in machined vs. polished of the razor itself. There aren't significative changes on shaving between them. What someone said, it's referred to V1 vs V2 for sure. So the question is 'What do I prefer?' On my taste the polished one is a true beauty.